After hearing several of my most trusted podcaster friends talk about the new documentary on James Randi, I decided to watch it. Netflix is streaming “An Honest Liar”, so I added it to my list, made some popcorn, and turned it on. I wasn’t sure what I was getting into, only that several like-minded friends recommended it. My friends may have enjoyed it, but I didn’t, for reasons I am still struggling with, so bear with me. For those who don’t know, The Amazing Randi, is a magician/escape artist turned debunker. He is famous for debunking Uri Geller’s psychic spoon bending tricks, and faith healer Peter Popoff, who it turns out, was not hearing the voice of God, but that of his wife through a hidden earpiece. Randi’s life long quest was to expose fakes and frauds like these and for that I have enormous respect for the man. The movie documents Randi’s role as a debunker and the lengths he would go to in order to flush out con artists and fakes. It was fascinating to see just how elaborate some of his debunking tactics were. 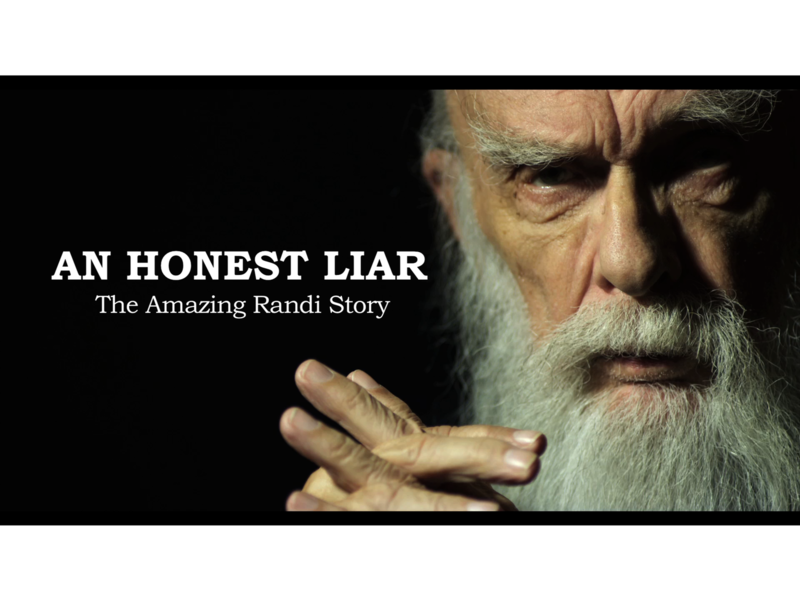 Randi teamed up with Australia’s 60 Minutes program to demonstrate the gullibility of people and the media. Randi released a fake press package (that no one bothered to check), and by doing so built up publicity for a “spirit channeler” named “Carlos”. Carlos who was actually an artist named Jose Alvarez. Alvarez drew crowds with his paranormal channeling abilities. After a few weeks of touring Australia, Randi and Carlos explained the hoax to 60 Minutes. Randi proved people would believe just about anything given enough authority and credibility. This is still true today. Con artist and pseudoscience peddlers get away with their snake oils largely because the news media either ignores the obvious, or in the case of Doctor, Oz, actually feeds into people’s gullibility. As I watched the movie, my admiration for Randi and the work that he did grew. As many of my readers know, some of my biggest frustrations are those who peddle pseudoscience, and unsupported “facts”. Those who make money off these types of endeavors are near the top of my worst people list; right below those who harm children, and animals for pleasure. Yet as the movie continued, I started to become depressed. You see, the more frauds and fakes Randi exposed, the more the masses seemed to turn on him. A hard truth hit me, people would rather believe in mystical abilities over scientific facts. No matter how much is at stake, people would rather take their chances with faith healing rather than Western medicine. To be far, it doesn’t start and end with religious beliefs. There is the willingness of otherwise smart people (usually woman) to have a herbal practitioner push a tube up their colon in order to “detoxify” rather than have a Western doctor place a camera in their same colon to check for precancerous polyps. As much as I think we need more people like Randi who are willing to expose myths and frauds, the movie showed me that my views might be in the minority. This doesn’t mean that I will stop. You will still find me outing pseudoscience through my blog, and my own podcast, once I can find a co-host with a better science background than mine. But what I won’t continue to do is comment on friend’s Facebook posts and contribute to Internet conversations. If nothing else, “An Honest Liar “showed me the futility of trying to educate someone who didn’t ask for it. But this is not why I didn’t like the movie. It was the filmmaker’s agenda that bothered me. Or, maybe, I just didn’t get the director’s goal. Did he make the movie as a tribute to Randi, or as we learn late in the film, expose a “hoax” that Randi willingly participated in. I don’t want to spoil the movie by giving the ending away, so it’s hard to fully explain why I’m torn. Randi is involved in something that admittedly does harm to a family, yet I am not sure the world needed to know about it. As I watched as the very painful and personal drama unfold, I kept asking myself, “Did I really need to know this? What good does it do to expose this very bad (but understandable) life choice?” For all of the good Randi has done for the world, I am not sure he deserved to have this exposed. On the other hand, maybe Randi has found some measure of peace now that it is out there. If I could have been convinced that this was the reason behind the director’s decision to include this, I would have liked the movie more. As it is, I was left feeling uncomfortable and sad. This is not a good way to end a movie about a man who devoted his life to exposing fakes who made millions off of desperate and gullible people. This is how I will remember Randi, who at 86 is now retired, not as someone who helped keep a personal hoax hidden. I just wish the director were a little more forthcoming with his agenda. This director seems to have set out to prove the paradox implicit in his choice of title, and in so doing maliciously impugns the contributions made by Randi over a lifetime. Yes, the title does set the tone. As a viewer you are aware that something paradoxical is being implied. But the first part of the movie is a basic bio, with a bit of narration hinting at a secret. The movie builds to it and then the big reveal. My discomfort came at the change in tone and view point. It is as if the director wanted to build him up just to tear him down a notch or two. Quite frankly, I am still just as confused as to the true intent of the movie. I’m not a fan of James Randi, nor his followers. I acknowledge the importance of debunking and exposing fraudsters, but Randi and the JREF people have consistently taken the position that the people who believe in these things are either mentally ill or just plain stupid. And while I would admit that people are stupid, I understand and accept that there are many reasons why someone would choose to believe woo over more reasonable explanations. Randi was a bully, and his people are following in his footsteps. Condescension and mockery are what they use to “teach”, and that, to me, is why people rebuke against them. I haven’t watched the documentary, but I’m familiar with Randi’s past successes and failures. His legacy isn’t enlightenment, it’s a clique of people who think they’re better than everyone who thinks differently than they do. Hey my friend, thank you for sharing your honest views. I appreciate and understand them even as I don’t agree with all of them. Randi can be a jerk but it I am being honest, there are times when I just want to smack the stupid out of people. At least he just yells. Next Next post: How long will it take you to read your entire TBR library?